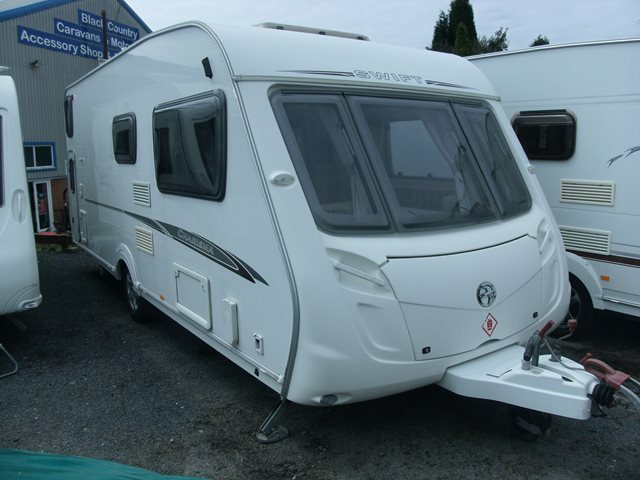 Our used Swift Charisma 570 is shown below, for more information please contact us. This six berth caravan from Swift features two bench seats to the front, a side dinette with fold up bunk, central kitchen and washroom facilities, and two fixed bunk beds across the back. The Charisma was a hugely popular range from Swift and this 570 has a good level of specification including CD/radio player, full oven with separate grill and hobs, microwave, omnivent, cassette toilet and shower, and removable carpets. For more information please contact us on 01384 413336 and ask for a member of the sales team.